We sit on deck and drink champagne on ice. But the biggest chunks of ice are not in the silver ice bucket, nor clinking in the glasses of those who prefer gin to bubbles, they are in front of us and all around us. A vast shimmering wilderness of blue-tinged ice. It is the coldest, driest, highest, iciest, most inhospitable continent on Earth. It is also one of the most beautiful. The land at the bottom of the world - Antarctica. This is a place of soaring snow-covered peaks, icebergs as big as islands and endless wedding-white wastelands. The luxury cruise ships that now head south offer an enticing mix of adventure and comfort for those yearning for experiences as much as 400-thread count sheets. And although it may seem that everyone is now going with the floe in reality only around 20,000 cruise passengers a year make it to Antarctica and of those only a lucky few travel on the more exclusive smaller vessels. This season (2010/2011) Abercrombie & Kent has chartered Le Boreal - what it claims is the most environmentally friendly ship available. The ship is launched in May 2010 and has many of those little extras that luxury travellers love such as an outdoor heated pool, theatre, lounge with dance floor, Turkish steam room, spa and fitness centre. A&K will limit passenger numbers to 199 so everyone who books will have an outside stateroom with a private balcony. Two years ago Silversea seriously re-vamped the ship that used to be World Discoverer and now the Prince Albert II takes luxury expedition Antarctic cruises. A vast SIMMERING wilderness of blue-tinged ICE. My own journey south begins in Ushuaia, a frontier town in the barren volcanic region they call Tierra del Fuego (Land of Fire) on the southernmost tip of Argentina. From there we set sail for the Land of Ice on a luxury expedition ship with a special ice-hardened, double-bottomed hull for negotiating through pack ice. However, first we must negotiate Cape Horn and the dreaded Drake Passage known for its force 7 gales and bubbling cauldron seas. Armed with every seasick remedy known I search for my cabin. As we head out into the Drake Passage for the two-day, 500 miles (800 kilometres) trip to the Antarctic Peninsula the water beneath us swirls and undulates; by midnight the seasick pill box on the purser's desk is empty. There are so many no-shows at breakfast it's like eating aboard the Marie Celeste. But our crossing is not bad. By day two the seas have abated and the crew are calling the passage the Drake Lake. Wandering albatross, straight out of The Rime Of The Ancient Mariner, follow the ship. Sleeping on the wing and rarely landing, they circle the globe. Their presence and the empty expanse of grey water stretching to the horizon make quoting Coleridge almost irresistible - water, water everywhere, nor any drop to drink. The following night we cross the Antarctic Convergence where the warm waters of the north give way to the frigid southern seas. The water temperature plunges from 5C to zero. At about four in the morning we are woken by something that sounds like a giant metal door slamming against the side of the boat. "Ice", we yell and leap out of bed. Medieval sailors believed that if you sailed far enough you would fall off the edge of the flat earth. As I stand on deck in the stark sunshine I feel that's exactly what we've done, landing in a strange new place. The kind they write about in science fiction fantasies. A mythical world with swirling mists and glittering magic mountains, full of sea beasts and strange birds. And the odyssey has just begun. We are sailing through the Lemaire Channel, otherwise known as 'Kodak Alley'. Jagged peaks rise up on either side like giant icecream cones. The sky is a savage blue and the glare from the icebergs hurts my eyes. Everything sparkles. Padded to twice my size in a downy regulation red parka (with which we've all been issued) and wearing a pair of oversized gum boots (good for wet landings, snow and wading through penguin guano) I step into the rubber dinghy which is heading for our first stop, Petermann Island. 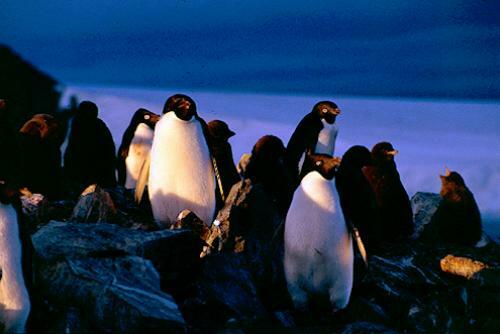 Penguins wearing their best tuxedos cluster on the rocks like an official welcoming committee as we go ashore. The snow is deceiving. With one step my foot sinks in a centimetre, with the next I am up to my knees. We human beings in our ungainly jackets, testing out the terrain, have acquired a rolling gait. We waddle exactly like the penguins.The big difference is that they are elegant in water, executing torpedo dives, speeding through it like little black and white bullets at up to 20 miles per hour (30km/h) and leaping out of the waves like a school of dolphins. The penguins are our constant companions. They float by on ice floes, crowd on to the islands and toboggan through our legs as they slide on their stomachs down to the sea. We learn to identify different breeds by their markings. On one island we come across what must be the penguin equivalent of New York. A vast colony of about 350,000 Adele penguins all jostling for space in the penguin metropolis.You can smell them from a mile down wind. Nobody mentions the fact penguins are smelly. But they are. Cute, but smelly. They build their nests from their own guano so a large colony is a pretty pungent place. Our other companions are the seals - we see a number of different species, their bodies heavy with blubber, their limpid brown eyes dreaming of the depths of the sea - and the arctic seabirds. The ornithologists on board are in raptures. One day we also encounter a pod of about twelve orca whales and journey with them until they threaten to lead us too far out of our way. However, in the end it is the ice which is the star turn. I sit on deck and watch giant icebergs, far bigger than our ship, glide past us like ghostly galleons. There are 'bergs stretching as far as the eye can see. The scene is mesmerising. I sit for three hours and think only half an hour has passed. At Paradise Bay, an Argentinean base, we set foot on the great continent itself - almost twice the size of Australia and 98 per cent of it covered by ice and snow. Glaciers hundreds of metres high form icecliffs at the edge of the sea.We take a ride beneath them and our black rubber Zodiacs are as insignificant as water beetles as we skim past. At the edge of one glacier there's a cathedral of ice as big as Notre Dame and iridescent-blue icecaves like giant gaping mouths. During our travels we come across several ruined huts. Man has made his mark here. The early explorers Scott and Amundsen and Shackleton were followed by whalers, then adventurers and scientists. A number of countries which jointly lay claim to the continent have bases here (Australia claims 42 per cent). But our footprint in the snow is light. At any minute the vastness of Antarctica threatens to wipe it out again. As our ship ventures further south into the Weddell Sea we get a taste of how overwhelming the white continent can be. Ice floes which have broken away from the Larsen iceshelf float around our ship, pressing in on it. We plough forward slowly; the ice gives way reluctantly against our reinforced bow. All around us the ice creaks and cracks. There is no danger; the captain has no intention of venturing too far south. But it's easy to imagine the fate of some early explorers when the ice closed in and squeezed the hulls of their boats until they split open like Brazils in a nutcracker. A reminder that, despite the fact that luxury passenger ships now cruise its freezing waters, Antarctica can never really be tamed. Pluses: National Geographic atlases in each cabin, a large library. Pluses: a Silversea ship which had a luxury makeover in 2008. The ship was called World Discover in its former Antarctic life. It has a beauty salon, Jacuzzi pools, a boutique, and a library. Luxury Berths: Many of the staterooms feature private verandahs, and all will have flat-screen TVs. Features some of the largest suites on any expedition ship.